Lord of the Rings was my way into the world of fantasy. Many, many years ago I read the trilogy when I was still at school. It was one of the reasons I drifted into the world of fantasy gaming, though predominantly this was a Warhammer adventure. Lately, I have come to like the aesthetic of the Middle Earth miniatures more and more. I have a fairly haphazard collection of orcs, uruk-hai, Rohan and Dwarves - and enjoyed a few games of Strategy Battle Game and War of the Ring, as well as using the figures in games of Dragon Rampant. Now, I am developing a little ruleset of my own, and am building the system around a piece of lore that fits my collection. 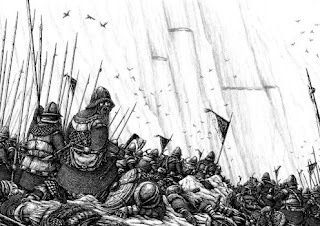 Welcome to this short article on the War of the Dwarves and Orcs. 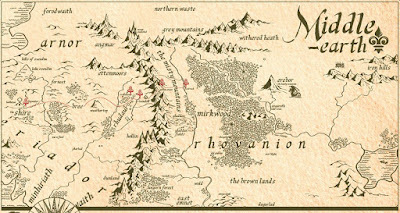 The conflict started with the arrival of Smaug the dragon at the Dwarf kingdom of Erebor. Thror, King under the Mountain and his dwarf warriors were no match for the serpent and were forced to flee their stronghold, wandering the wilds until finally settling in Dunland. After twenty years of living in poverty, Thror set off with his friend Nar, to look upon the ancestral hold of Khazad-Dum, also known as Moria. 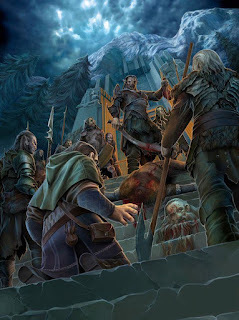 Fearing it was occupied by orcs, Nar pleaded with Thror, but the old king was adamant and entered the former stronghold. For days, Nar kept watch at the east gate, until finally his worst fears were realised. Azog the Orc Chieftain had captured Thror, branded his head with his own name and tossed it out the gate. He allowed Nar to live, to return to his kinfolk to warn them to stay away from Moria. Nar delivered this message to Thrain, Thror's son, who brooded for a week before deciding his father should be avenged. And thus the war started, a simple tale of revenge and bloodshed. 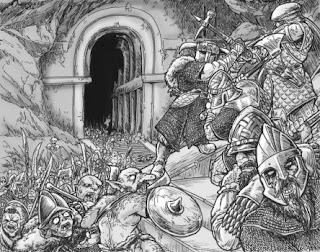 Thrain travelled to the other six great dwarf houses, mustering a huge dwarf army over a period of three years. They then marched to war, systematically sacking and destroying every orc hold they could find in the Misty Mountains, from Gundabad in the north, to the Gladden in the south. After six long years of battle, the War came to a climax at the Gates of Moria, where it had all started. Known as the Battle of Azanulzibar, it was here that Thorin gained his name Oakenshield, forced to use an oak branch when his shield shattered. 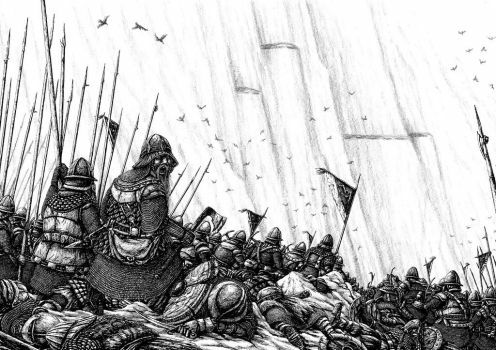 It was only the late arrival of a contingent of dwarves from the Iron Hills that swung the battle for the dwarves. 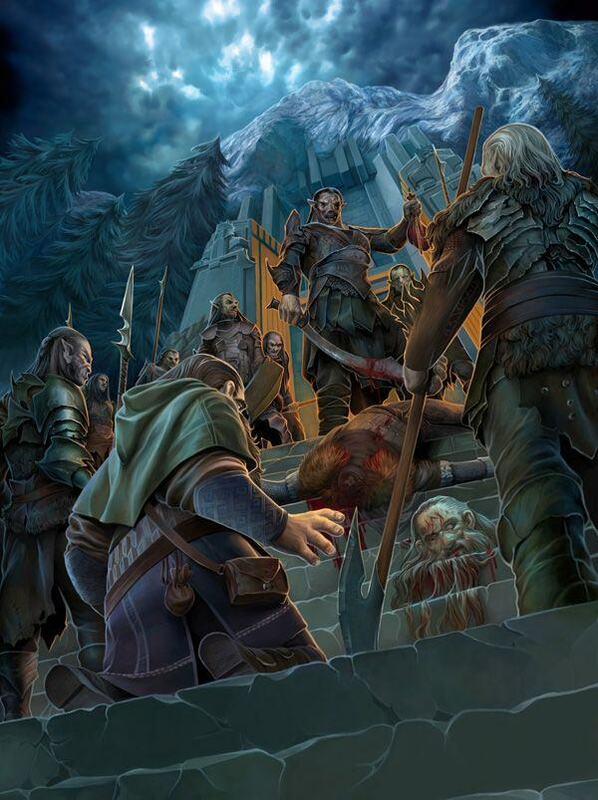 Nain the king of the Iron Hill dwarves was slain by the orc chief, Azog. It was Nain's son, Dain, who finally brought down the hated foe, swinging his red axe to decapitate the great brute. The orcs fled the battlefield. And thus the war that had started with a dwarf losing his head was ended with an orc decapitation! 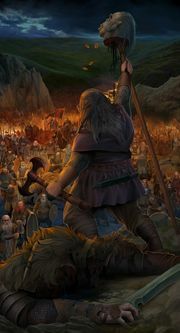 The victory was bought at great cost to the dwarves. They had lost at least half of their force. There were so many dead that they were unable to bury them in tombs as was their tradition. Instead, they cut down the trees in the dale to build huge pyres to burn their fallen. Thrain wanted to enter Moria to retake the fabled dwarf stronghold, but his companions had suffered too many losses. The dwarves returned home to their holds. 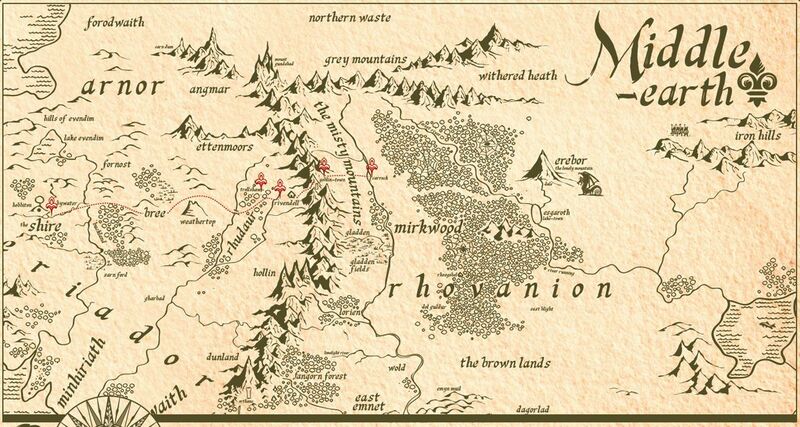 Thrain and his son Thorin returned to wandering Dunland, while Dain returned as the new king of the Iron Hills. Their paths would meet again at Erebor in the Battle of Five Armies, as told in The Hobbit. What a stirring tale! Epic in nature, with so many tales untold, so many battles to ponder over. This has really got my imagination fired. The hobby lull is most definitely over. Expect more dwarfish activity very soon. 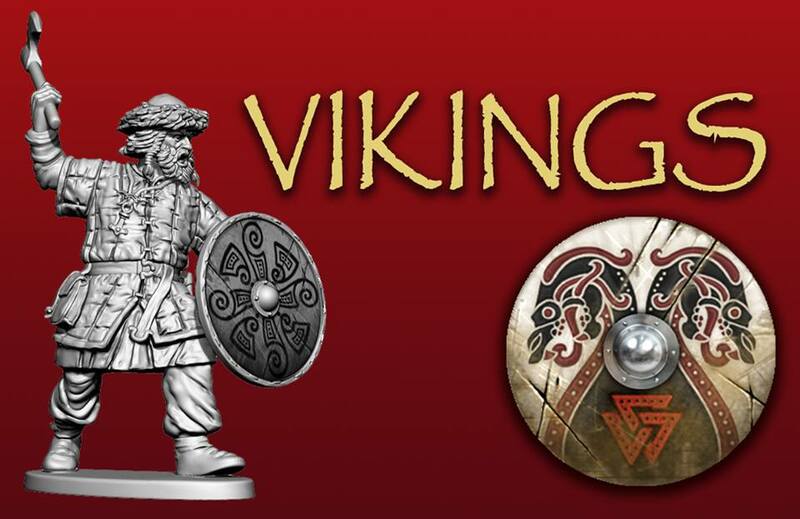 News has been trickling out over the past few weeks that Victrix Miniatures are moving into a new era - the dark ages. It seems that the first range will be Vikings. I have also read that Saxons and Normans are to be produced. Now we have a little more detail announced on the Victrix facebook page. 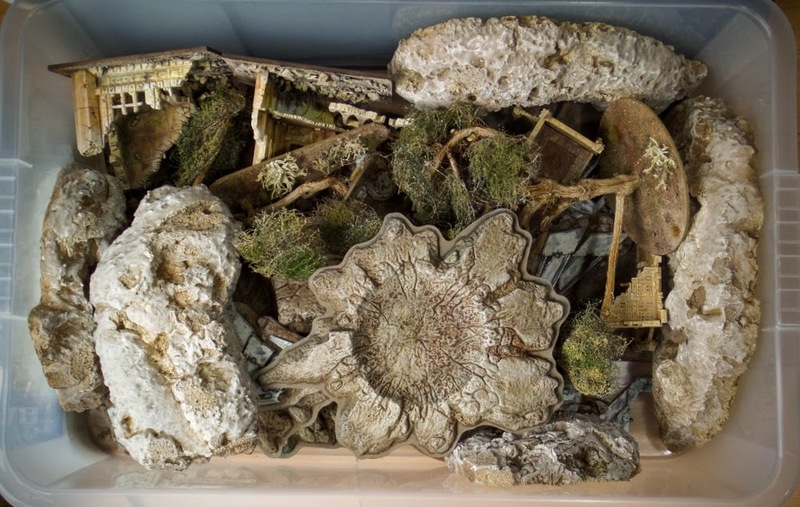 The box will contain a mix of armoured and unarmoured warriors, four of each on a sprue. There's usually six sprues in a set, plus extras on a command sprue, so about 50 models in a pack. Enough to man a viking longboat! The release date is sketchy, I suspect that they are not even sure themselves as yet. I might have read late 2018 somewhere. This picture shows one of the body sculpts coupled with different head and arm options. For me, this is just the ticket. I can look forward to well sculpted, affordable minis. 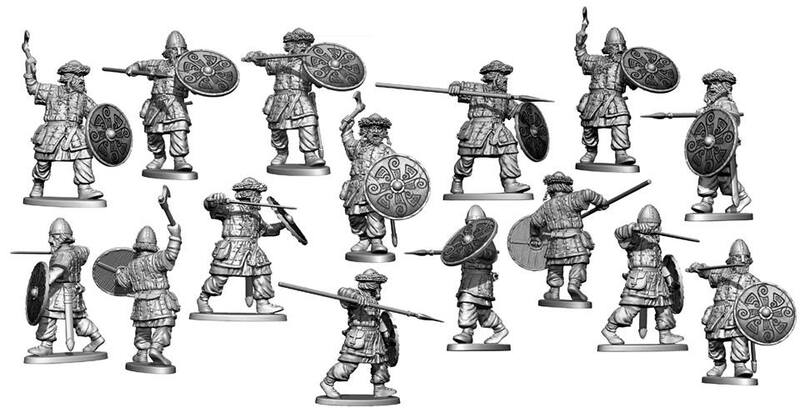 If the rumoured Saxons and Normans are anything like this first view, I will be knee deep in dark ages minis. May the Fourth Be With You. It's a thing, apparently. I am not really much of a Star Wars fan, but I do like a good pun. 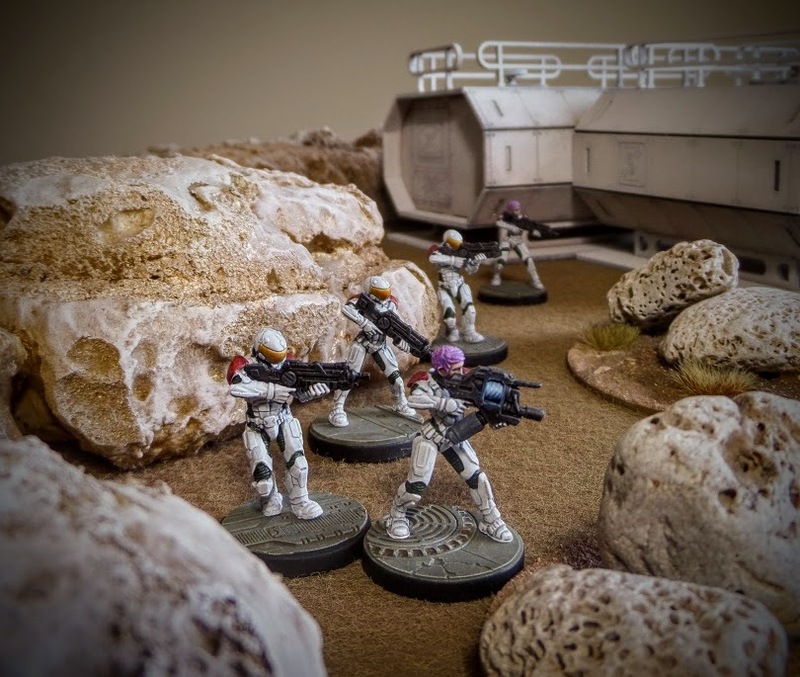 To celebrate this great day for geeks everywhere, I put my sci fi collection together with my newly painted rocky outcrops for this little image which I have grandly titled Incident at Hab Zone 161. The figures are from the (long forgotten?) Sedition Wars range. They painted up really nicely and would make a great little force for a skirmish game. I really should get some more of them painted. 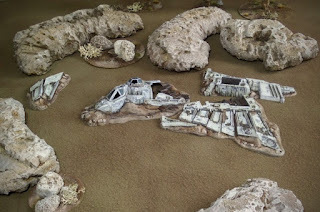 This is the kind of sci fi look I prefer, less Star Wars or 40K, more Moon Base Alpha. * The base in the background is the start, potentially, of a little side project, just primed at the moment. I really should not get distracted, this is what happens when you tidy your garage! Having a tidy up in the garage, I came across these random shapes. 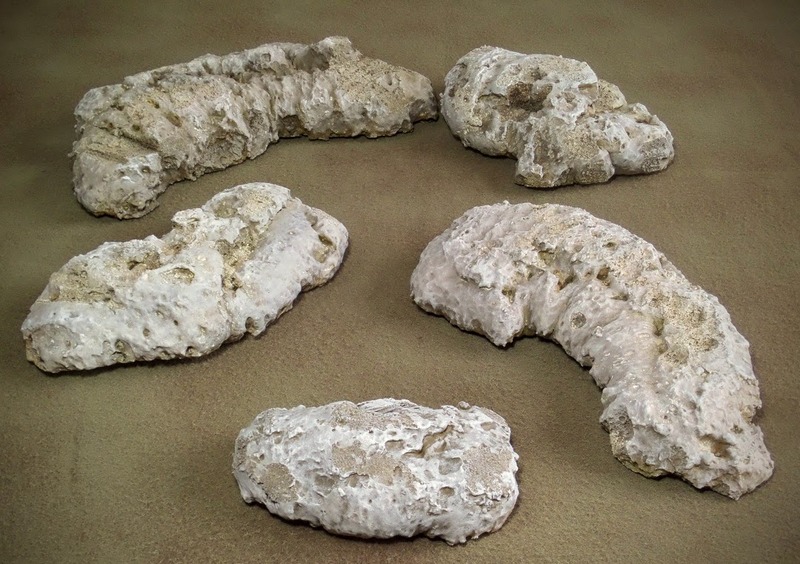 I had made them some time ago, from gap filler foam - the stuff used by builders and plumbers to fill in holes. It comes in a tube and I just sprayed a few blobs on to greaseproof paper (baking parchment). When they were dry I peeled off the paper and removed some of the weirder lumps with a hobby saw. Then I partly brush primed them white, fearing that solvent primer would simply melt them, then left them to dry. And then found them again several months later. With renewed resolve I speedily painted them, using army painter primer and some cheap craft paints. The primer did not seem to affect the foam as I had feared. 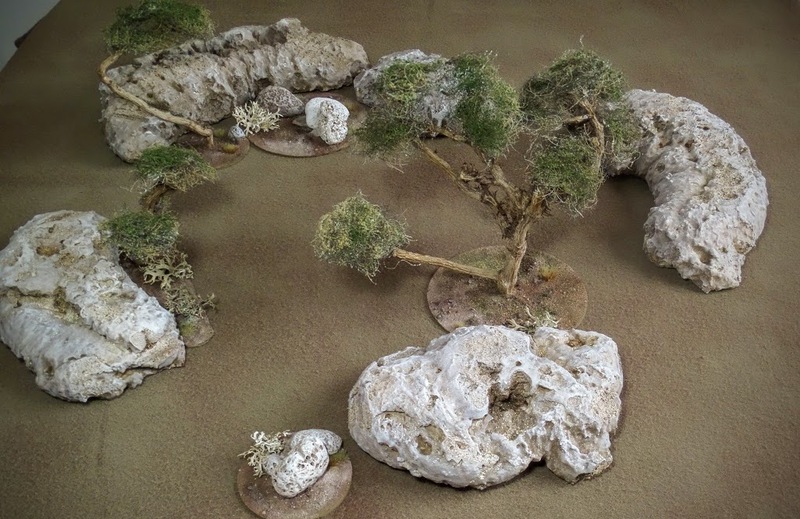 Quick and easy rocky outcrops to add to my desert terrain collection. Now I just need some figures to explore this new wonderland!